At least, malady as imagined by the late illustrator Ed Emshwiller. 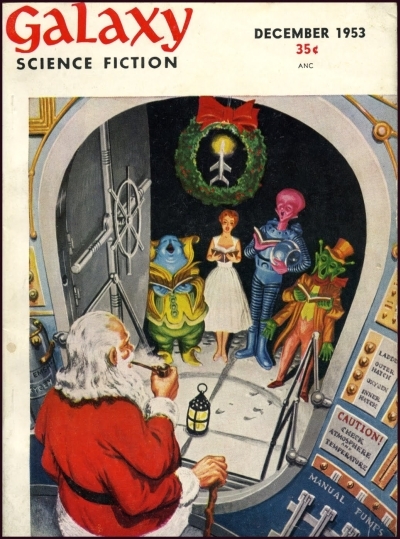 A future in which a twisted and mutated Santa Claus, an extra pair of arms sprouting from the sides of his torso — no doubt due to prolonged exposure to radiation — looks down upon the horrible, alien carolers that have come to serenade him in his fallout shelter. 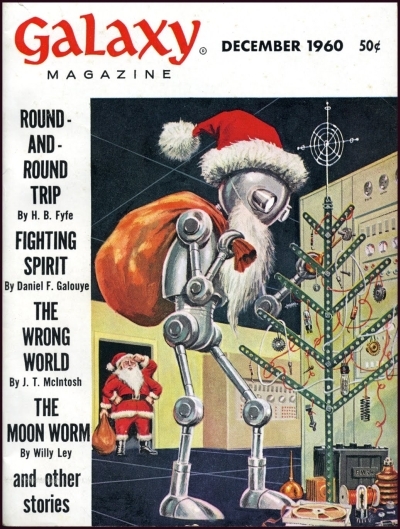 A future where robots, those accursed machines, soil the holiday in another sick attempt to replicate their creators by erecting a cold, joyless approximation of a Christmas tree. It is a bleak, bleak future dear readers. Let us hope it never comes to pass. How very intriguing. I may have to find a copy of this issue of galaxy magazine and buy it. Nice find! Those are oddly charming. Season’s greetings, ladies!